Because the world is not flat. In January this year, I became painfully aware of the strange limbo existence between finishing research and finishing my PhD. I had a clear vision of my ready thesis in my head, yet I had nothing concrete to show for it. 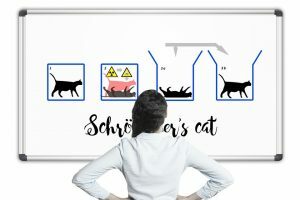 In a way, my PhD seemed at the same time finished and nonexistent – kind of like Schrödinger’s fabled cat. It is a uniquely stressful stage of the PhD journey, knowing that you are almost done, but at the same time facing possibly the biggest challenge along the way: convincing others that your work is worthwhile. Writing the actual dissertation is a rollercoaster ride on its own. The euphoria of finishing this chapter, that idea, the whole manuscript, is contrasted by the complete panic slowly setting in regarding whether your supervisors will reject your ideas, whether the pre-examiners will dismiss the whole as complete nonsense, and whether you have actually achieved anything in the past four years or so. Luckily for us in IB at TSE, we have an amazing support system. Our supervisors are brilliant, encouraging, and supportive, our colleagues are amazingly helpful, and our fellow doctoral candidates a constant source of peer support. It is the community around us that gives us hope in times of despair and lifts us even higher in times of triumph. And that support, in my experience, has become increasingly important in the final stages of the doctoral journey. When I had just begun my research, I certainly thought about when I might finish up, when I might have my public defense, and how it might feel. But as these things creep closer, I am constantly finding new things to worry about, new steps along the way. From writing down four years’ worth of learning and ideas to handing the manuscript in, from how to type the manuscript to which printer to choose, the final stage of the doctoral journey is a mix of academia and bureaucracy. It is a blessing, if during that time there is also something else to occupy the excruciating times of waiting to hear the verdict. For me, an exceptionally useful and pleasurable diversion was the Three Minute Thesis competition. I had thought about entering the year before but struggled to pinpoint what I wanted to tell the audience. And I was right to do so: I believe this exercise is most beneficial when you already have a grasp of what your findings are. During the 3MT coaching sessions I learned many useful tips on how to make your message compelling, be it at a pep rally or an academic conference. I quite like the idea that even as academics attending conferences where people presumably share our ideas and interests, we should aim to provide our viewpoint in a clear, concise, and engaging manner. Moreover, it is likely much easier and takes way less preparation for most academics to speak about their research for an hour than for three minutes. Therefore, I encourage everyone, doctoral candidate or professor, to try to fit your passion into three minutes of speech. I promise you there will be several benefits; really getting to know what the key points in your message are, understanding what you yourself are most excited about, and finding out your own strengths and weaknesses in speaking to large audiences. I am happy to say that for me, 3MT was a success. In a competition designed to measure your skills in pitching, the audience voted my pitch their favorite. As the whole point of the competition is engaging the audience, I secretly (well, not so secretly anymore) kind of consider this the first prize, whatever the judges have to say. Check out my pitch below and stay tuned to see me sweat at my public defense in the autumn. Could this stage be called Doctor in spe in spe – in the hope of being in the hope of becoming a Doctor? A news from UTU webpage of the final: Tiina Lehtiniemi voitti 3MT-kilpailun. # A changing world. From the late 1980s to recently – we see diminishing abilities of MNCs in general to: (a) Use institutional ‘deficiencies’ across the globe to their advantage (e.g. transition and developing economies closing institutional gaps; international cooperation to reduce spaces to allow this kind of opportunism, etc.). (b) Utilize arbitration advantages – in a model in which MNCs optimize internal division and integration of work internationally – many previously important location advantages have been changing (e.g. China). For instance, instead of cheap labor we see that now technology is gaining importance. Arguably, in the longer run, when technology takes over to define competitiveness, then costs are likely to fall in general, while labor cost are generally likely to rise when economies grow. That means also that for many production locations the competitiveness might be more critically determined by other factors, e.g. infrastructure, market seeking or resource seeking motivations – shifting bases of location advantages. # Business models. In many industries, we see post 2008 a change in the business models which generate greater value. Until then it was challenging for local firms (especially in smaller economies) to overcome traditional MNCs’ (a) monopolistic advantages (e.g. in form of immaterial rights, IPR, brands, etc.) and even harder for local firms to develop (b) scale and scope economies to match MNCs in a liberalizing global trade landscape. Comparing the largest firms (by market capitalization as the shared understanding of future promise and growth) 10 years ago and now – the top 10 list of most appreciated firms looks rather different. What do these firms do differently? They shifted the game from economies of scale to network economies. That requires an ecosystem, where firms’ immaterial rights are entered into a larger system of value creation and the more actors enter that ecosystem the higher the potential (and thus the realized) value these ecosystem drivers can produce. This has started to have implications also for the typical Finnish firm (industrial markets, global tech leaders in their niches). Business models are also shifting for them and for their typical linear value chains. To stay in the lead, firms need to build cooperative networks attracting partners who enter their capacities into a larger pool and these ecosystems might subsequently compete with other networks of firms on global scale. These new business models run under many labels, focusing on slightly different perspectives, including ecosystems, networks, solution business approaches, service innovation approaches, open innovation arrangements, etc. But they have some core items in common that relate to the question of how value is generated, and given the trend to converging industry approaches through technological advance (i.e. the industry 4.0 catch phrase), – it is a cooperative effort within ecosystems of specialized partners who need to bring in their specific capabilities and mechanisms. # FINNVERA’s role. In many important industries, for Finland, FINNVERA has de-facto been an ecosystem partner. There is no subscription to a membership, it evolves through adaptations to dynamic environments and is largely defined by actions rather than ex-ante designed structures. FV is the partner firm needed to compete in certain global markets. Without their contributions to some ecosystems it would be rather impossible to build high tech (or any) large ships in Finland; it would be difficult to develop and commercialize state of the art power plants for onshore energy generation; difficult to sell 4G, 5G networks (even to some Western partners); or to build major state of the art pulp mills, to name some examples. # Concluding. This sheds an interesting light on the issue of international finance and how Export Credit Agencies, like FINNVERA, are performing strategic functions with Finnish MNCs, in some industries. Their function is to help Finnish Multinationals’ customers to manage enormous international risks; they provide the enabling mechanisms by which Finnish firms’ customers and their banks can put together long-term financing, on the back of Finland’s appreciated credit ratings. At the same time, FINNVERA, as a necessary competitive factor to enable international finance of large projects, is in ‘regulated competition’ with other Export Credit Agencies around the world, without which major Finnish firms would have fewer options ‘to play’. For our discipline of International Business, this implies that we need to review our frameworks and models and widen the scope. The ‘international success and failure of the firm’ is not only determined by necessary conditions found inside the firm and based on firms’ choices (e.g. locations and governance), but by a functioning ecosystem, that includes strategic partners like FINNVERA. They enable many major firms to enter into international competition to start with. In today’s world, political development seems to have great impact on the business environment. The current and best known cases are the ‘Brexit and Trump phenomena’. The global warming challenge is basically dependent on political decisions, but creates both risks and also new opportunities for companies. It seems that the globalization is facing major setbacks and national interests are emphasized in political decisions. In the big picture, major political powers like the US and UK are isolating themselves from global and EU communities. Russia’s decision to annex Crimea to itself and start military operations in the Eastern region of the Ukraine forced the EU and US to establish economic sanctions against it. Gradually, these sanctions and the trade war between the US and China will have a major influence on business activities, and is decreasing global economic growth. Indeed, MNCs can today be considered as quasi-governmental institutions having much power over social and societal life in general. The big challenge for MNCs is that they have to interact with many national governments, which all have their own policies. No doubt, situations arise in which there are real conflicts between MNCs and nation-states. Examples of MNCs actions increasing conflicts of interest are: tax avoidance and tax evasion, profit shifting, endangering workers’ health and safety, disrespecting local cultures. Examples of government policies increasing conflicts of interest are: excessive taxes and fees imposed on foreign-owned businesses, discriminatory government procurement policies, restrictions on repatriation of profits and surplus capital. These questions are at the core of my new research project aiming to publish a book in the foreseeable future. What lies ahead for International Business professionals? This popular award winning song by Jay Livingston and Ray Evans was introduced in 1956 in the Alfred Hitchcock film ‘The Man Who Knew Too Much’ but its message seems very true still today. Even with all the big data collected on us humans, with more information than ever just a few clicks away, and with all the accumulated scientific knowledge published in numerous books and journals, it seems that we certainly don’t know too much, not even enough, about the future. Indeed, as a Nobel Prize winner physicist Niels Bohr (1885-1962) once said, ‘Prediction is very difficult, especially about the future’. This holds true also for the future of International Business (IB). For instance, at the turn of the millennium, Sheth and Parvatiyar (2001) predicted the end of international and its reincarnation into global, along the emergence of a borderless world characterized by regional integration, ideology free world, technology advances and borderless enterprises. In this borderless world, differences between cultures, countries and regions were considered diminishing, suggesting that the global markets could be served by standardized marketing mix tools with less and less need for international adaptations. For more than a decade, this prediction seemed to hold true. We even started to take the globalization development for granted. We do have technology advances and borderless enterprises, but otherwise, the course of history has taken unanticipated turns: instead of ideology free world, we got the rise of strong nationalistic and religious fundamentalist movements, instead of increasing regional integration we got Brexit, and instead of the triumph of globalization and free trade, we got Trump and increasing protectionism. So, what kind of future is there for those studying to become International Business professionals? This question was dealt with our master’s level students on a new foresight course ‘TULEVA’ launched this autumn. With the future research methods they had learned during the course, teams of students were asked to create different future scenarios on what their professional field might look like in 2050. The scenarios were presented to audience with posters, videos or other types of presentations on computer screens at the course closing fare at Mercatori in October. The future scenarios of teams with IB students recognized a number of possible development paths and their likely effects on international business. For instance, digitalization and the development of artificial intelligence are likely to effect also the work of international marketers as routine tasks will be automated; increasing world population and climate change might cause drastic changes on our consumption patterns and international logistics and trade; and the political tensions and conflicts between countries may lead to new sanctions and protectionist measures that eventually would slow down world trade. At the first glance, this latter scenario certainly doesn’t seem as a positive one for IB professionals. If this is to happen, will we be needed in the future? Even in the scenario of diminishing world trade and shrinking global markets, the students didn’t see the future for IB professional overly gloomy. Instead, they envisioned that in such a world, global trade requires strong competences of people specialized in international business. Hence, whatever will be, will be, but even in the darkest future scenarios, international contacts between people and global trade will remain, and therefore, the skills of IB professionals will still be needed. And let’s remember that future is not entirely given, it is also what we make of it! The roots of digitalization – and why should an IB scholar care about them? The theme of the last summer’s AIB World conference was Digitalization, and as a scholar lodged somewhere in the nexus of international business, information systems and futures studies, I was thrilled. Finally a chance to reflect the international business implications of technological advances! Finally a chance to draw from the multidisciplinary heritage of IB to craft insights sorely needed in creating a wider view about the technology driven changes ongoing in the realm of global business! Well, I did have a number of highly interesting discussions and downright debates about diverse digital phenomena and business implications, and overall enjoyed the Minneapolis conference immensely. However, I couldn’t evade a nagging feeling that somehow most of the discussions missed something crucial. A passing thought in one of the very interesting Fellow’s Café morning sessions (warmly recommended if you’re planning to attend the AIB 2019 in Copenhagen, very good session concept) became a seed that, nourished by my doctoral research, subsequently blossomed into a metaphor I’ve since used extensively in articulating my specific vantage to the phenomenon labeled digitalization. In my view, the phenomenon captured by the fuzzy label of digitalization can be understood as a tree. The familiar “things” like Facebook, cybersecurity, artificial intelligence, Google, internet-of-things, Amazon, platform economy, to name but a few, constitute the leaves and branches of the tree. Scrutinizing them yields increasing understanding about the diverse representations, however the entity of the tree cannot be understood only through its foliage. The tree has a trunk and roots. In my dissertation, which I defended in November, I identified three roots of digitalization: datafication, digitizing and connectivity. Each of the roots go back in time, but it is only with the recent technological advances that they have converged in the trunk of digital infrastructures, making it possible for the tree to sprout such growth as we know evidence in its thriving leaves. Put simply, the root of datafication means that entities with another form are given a data form existence. What started with the innovation of writing has evolved to include the sophisticated sensor technology that enables the datafication of the physical attributes of everything (weight, movement, sound, constitution – the details of the tiniest microbes and the vastests of stars). In addition, datafication includes also the traces of human-machine interaction: when you stop to read a post on Facebook, that mere pause becomes data even when you don’t “like” the post. The second root of digitizing simply means that the data gleaned from entities of diverse types is made uniform, into binary digits of 0 and 1. In theory this means that any digital data can be processed through any digital device – however in practice we’re not there yet. Combined with the third root of connectivity, dating back to signal fires and homing pigeons, exponentially evolved with the invention of Internet and the advances in communication technologies, this means that again in theory, it could be possible to create a zone of convergence where all that is uniform data can be accessed through one entry point, by one or a number of agents. Currently we are seeing pockets of convergence, more familiarly referred to for example as the Apple or Google ecosystem, where everything that is happening within, is to an extent visible to certain agents orchestrating the ecosystem. In the near future, the battles between the expansions of these (overlapping) pockets of convergence are possibly some of the most prominent features in the realm of business. But when we look at the trunk of digital infrastructures, it is no longer only the realm of business that is affected by digitalization. Like any infrastructures, the more they develop, the more dependent on them we become, and the more invisible they become. Few of us think that “now I am using a phone”, instead we’re just talking to a friend, checking the news, liking a comment or booking a ride. However, unlike the older infrastructures like electricity or plumbing, we don’t only use the digital infrastructures, but actively contribute to creating them with all our datafied, digitized and connected interactions with the digital devices and sensors. Our intentional and unintentional actions become the building blocks of the subsequent developments of the digital infrastructure – for better or for worse. Just like the diffusion of electricity, digitalization is not dependent on any singular technological breakthrough – or the fate of any of its leaves or even branches. Once the humanity learned to harness electricity, no obstacles, technological or socio-political, could stand in the way of the development that led us to the electricity-dependent society we now live in. While I do not claim to be a prophet, it is immensely likely that digitalization will follow a similar path. The nagging sentiment I was struggling with in the summer was that I felt that in IB, we are still seeing only the already grown branches and leaves, but do not yet conceive the depth of the potential changes emerging from the infrastructural level changes driven by datafication, digitizing and connectivity. Of course, the future is more (or less – or else) than a continuance of the past trajectories, and as such, always shrouded in mystery. However, as the possible impact of full convergence has the potential to transform not only our lay existence, or the realm of economics, but the very structures of our society on par with such game changers as the agricultural or industrial revolutions, taking a moment to envision a future where the current trajectories continue might not be a wasted effort even to the IB scholars. 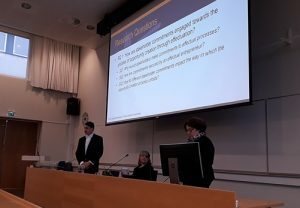 A little over two weeks ago, around five years of cumulative effort reached its zenith when I defended my doctoral thesis in a public examination in the LahiTapiola lecture hall of the Turku School of Economics. For this reason, I was invited to write a blog post on the event. This is that blog post. As one might imagine, after all of build up over the last few months, I am now suffering with a bit of fatigue in relation to talking about my thesis, though if you are interested, you can read more about it here. Instead, I thought I might use this opportunity to delve into the tradition and history of the public defence process and ceremony as it is practiced by Finnish universities. If you are not familiar with the tradition, the day of the defence (in my experience) proceeds like this: In the morning, if you are male (though I am sure females are not denied this pleasure) you stuff yourself into a penguin costume – a tailcoat, waist coat, and white bowtie ensemble originating from the 18th century. While not being the most comfortable form of clothing, it does make you feel fancy and encourages you to maintain a dignified posture. The formal proceedings begin with a light, cold lunch with your supervisors and your opponent. For the doctoral candidate, the food serves more as something just to stare into rather than as a form of nourishment. You are soon joined by a representative of the faculty for congratulations and encouragement (in my case the Head of the TSE Doctoral Programme). Also for encouragement, the University provides a fine bottle of cognac and a bottle of sherry to take the edge off your nerves (a single nip usually suffices, though you can sneak another while nobody is looking). After the lunch there is a brief photo session with University Communications. Each step of the way you are separated from your opponent by your custos, (a guardian role held by one of your supervisors) who is your last line of defence in case things get violent. coffee served at the end. Having attended a number of public defences over the course of my doctoral research, I can say with confidence that every defence is as diverse as the personalities of the opponents and candidates that take part in them, and no two defences are the same. Unfortunately, my research into the origins of the custom of the public defence in Finnish academia did not take me very far. Extrapolating backwards from its current form, I would like to imagine that early public defences in Finland were conducted with participants donning full medieval armour. The opponent would ask a cutting question while delivering an equally cutting blow from a broadsword and the candidate would respond with a witty rejoinder and a parry, all the while the custos, a shield in each hand, desperately attempting to keep the two apart. Such displays of intellect combined with physical prowess are these days only to be found in the chess boxing arena. The public defence ends with a final statement by the opponent, where he or she delivers his or her verdict on whether or not the dissertation should be accepted. In Finland, unlike in some other countries, that the dissertation will be approved by the opponent tends to be given, with any severe issues being addressed during the pre-examination process, and it would be a dark day, indeed, were this not to be the case (though I have heard whispers down darkened corridors of just such occurrences). Once the opponent’s statement is complete, the candidate can wipe the nervous sweat from his or her brow, thank the opponent, and then ask the custos to open the floor to questions from the public. It is known among the academic community that, just like when a priest asks “speak now or forever hold your peace”, this is just a formality, and protocol dictates that the public should not in fact expected to ask any questions. The public, however, do not always know this, so the custos is usually quick to stand and conclude the proceedings before a particularly inquisitive individual is able to form the words to their burning question. If, however, a member of the audience is quick enough to the draw, and is able to their question, formality dictates that doctoral candidate should then invite that individual to the evening celebration, or Karonka, which is held in honour of the opponent. Formality also dictates that the questioner should politely decline this invitation. Of course, if one is unaware that they should not ask the question, it stands to reason that they would most likely be unaware that they should turn down the invitation to dinner. Sadly, I have not yet heard of any case when a hapless member of the audience has accidentally invited themselves to someone’s Karonka celebration. After all the dust has settled following a doctoral defence, inevitably every fresh doctor must then consider what to do next. While some already have new research, lectureships, or positions in industry lined up, and others return to their full time employment (or retirement), for people like myself, who were so focused on reaching the top of the mountain that we did not take time to consider what would be on the other side, the future is less certain. No matter how misty the view from the other side of the mountain may be, however, one must remember that achieving a doctorate is just a beginning, and a challenging but exciting path lies ahead. In 2016, the UK Prime Minister, Mrs Theresa May gave a speech at a Conservative party conference. One quote from her talk attracted a huge media interest, and Theresa May was accused of rejecting the Enlightenment values and suffocating the exchange of knowledge between the UK and ‘outer world’. Mrs. May is not alone with her opinion; a number of other politicians around the world have joined her in criticizing the spirit of cosmopolitanism, and rootless, internationally mobile people. What’s the problem? Cosmopolitans usually refer to ‘free spirits’, individuals who feel at home everywhere and value multiculturalism, mobility and disengagement from national and local anchors. For them, the world is one big, boundless space, where geography, place, countries, and other traditional location-based characteristics do not limit the way they perceive their opportunities to live, work, experience, and learn. Digitalisation, technological development, and globalisation gear the mindset of younger generations towards a cosmopolitan disposition. These individuals possess competences, which are needed in the multicultural and constantly shape-shifting global playground. Mrs May’s concerns emerges from multiple issues. To start with, from the viewpoint of a politician, a diluting national identity is a threat. Unfortunately, Mrs May and other politicians do not seem to be aware of the fact that a person can have multiple identities. In fact, there are studies confirming that a strong European identity, for example, can co-exist with a strong national identity. Another worry is that cosmopolitanism is linked with international mobility; an issue which has caused a long-term headache for many politicians. Statistics verify that young, highly-educated people leave Finland and do not return. At the same time, climate change and armed conflicts force millions to abandon their homes and start an endless journey to find a place where they would be welcomed. While these drivers of migration differ dramatically, they constitute parts of one phenomenon: The whole world seems to be on the move, and politicians dislike the fact that they are not able to control it. As scholars, we have been very interested in this new, more dynamic world and its reflections on the future of work. Additionally, we feel that as neutral observers we might also act as mediators. The media keeps up a heated debate on values, identities and immigration, and there is a clear division at the heart of contemporary politics. The anti-cosmopolitan statements of politicians have raised a countermovement with media coverage, badges and t-shirts for “Citizens of nowhere”. We hope that improved understanding of cosmopolitans would facilitate the co-existence of diverse identities, smoothen the dialogue between the different fronts and hopefully bring the currently conflicting views closer to each other – both in cases of voluntary and involuntary migration. This is the key motivator of our new research project COSMO. Interdisciplinary co-operation is highlighted in the mission of Turku School of Economics stating: “We produce high-quality intellectual contributions drawing on discipline-based and interdisciplinary scholarship… “ What does it mean in praxis? Interdisciplinary co-operation can be an eye-opener. I have learned much more about innovation diffusion in an old cemetery in Britain than in all the tens of innovation-related conferences I have been visiting. Best insights into customer journey and customer experience I have gained from doctors and experts in psychology and philosophy. Anthropologists have taught me more about methods than all those method-related articles from my own field. This is not to undermine my own disciplines. On the contrary, I am very proud of Innovation Management and International Business and feel that they are very suitable for dealing with complex contemporary issues. However, understanding human behaviour entails studying complex networked intertwined dynamical systems. Consequently, research problems become more multifaceted and multidimensional – leading towards more complex research designs. This is where interdisciplinary research settings are required. However, interdisciplinary projects can be difficult mountains to climb. Disciplines are steeped in decades or centuries old traditions and worldviews. Researchers are experts who have socialised habits that are hard to unlearn. Interdisciplinary communication is demanding and it entails a high risk of misunderstanding. Therefore, partner selection in interdisciplinary projects is extremely important. Good interdisciplinary partners are a scarce resource worth gold. One of the most important capacities of a researcher is continuous curiosity. Interdisciplinary projects feed the curiosity by opening new worlds and discomfort zones – and that is where the Eureka moments are born. If you want nice, neat and safe progress with well-focused topics, interdisciplinary projects may not be your cup of tea. Then do not expect disruptive ideas either. If you are fine with learning constantly new things and connecting your ideas to even unconventional fields you are lucky; you may not have the clearest career path but I guarantee that you will certainly have much more gratifying moments while wandering along it! I write this short blog to share with you a few of my experiences as a Visiting Scholar at Stanford University, California, USA. 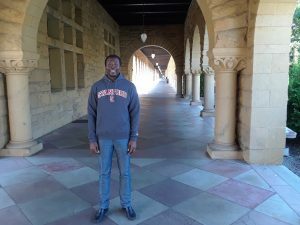 My time at Stanford was rather short (3 months), but it was indeed intellectually invigorating! I came here during the summer quarter, which is a much more quiet time of the year in Stanford University just like in Finland. However, as a very large University as Stanford is, the place is always full of different types of seminars, conferences, executive training programs, and other activities. In fact, I seized the opportunity to also participate in some of these activities for free (once I showed my Stanford ID card). Kris on A confession of an addict.